As a part of Networking Month here at Management Consulted, we’ve been planning and plotting a major brain-dump so we can share with you best practices on all aspects of networking – from making first contact, to informational interviews, to working a room, and more. 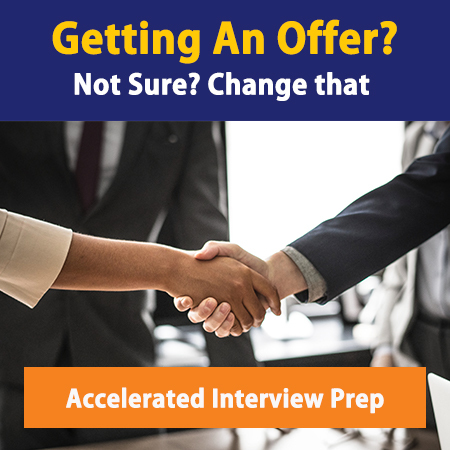 One of the key tools you’ll need as you embark on this endeavor is an elevator pitch – your introductory, 1-minute (max) highlight reel that will snag the listener’s attention – hypnotizing them into offering unlimited assistance in your consulting job search. So, what makes a good consulting elevator pitch – and how do you create one? Developing a great elevator pitch – in essence, your brand statement – will prepare you to leverage contacts you meet in any situation – in social settings, on planes, while touring museums, or attending conferences. Whether just out of B-school or trying to break into consulting mid-career – spending a few minutes now developing a truly unique and powerful message you can use to let people know your goals will pay off a thousand times over throughout your career. 1. Drop brand names of universities, past employers, awards, etc. Pick 2 or 3 and weave them into your statement to make a strong impression. Whether or not the person you’re talking with remembers anything else from your conversation, they’ll remember this. Make sure to know what kind of reaction you’ll get before dropping brand names here and there, because this can work for or against you. If you went to a top brand name school, include it. If you spent the last 2 years working for a boutique firm with a poor reputation, or an investment bank that no longer exists, politely omit it – you don’t want your contact to remember you on that experience alone. 2. Don’t focus on roles and functions, but on qualities and skills. When explaining your experiences, don’t focus on the positions you held or the functions you had. Imagine if someone told you, “I develop websites, run restaurants, fly helicopters, and manage properties.” Your first reaction would be – this person is all over the place! To avoid giving the impression that you’re unable to direct your energy effectively, focus on the qualities of your experience and the skills you used. She portrayed what she offers in a convincing and believable way without going into detail about every job she’s ever had at every company she’s ever worked for. 3. Be positive. Focus on what you have done, what you are looking for, what you do like about your current position – not the opposites. It conveys a clear sense of direction and an eagerness to achieve. To address a common misconception here – you don’t have to show that you’re disgruntled at your current job to be seen as “available” or “on the market.” In fact, those that often capture the highest salary premiums and receive the most aggressive recruiting efforts are people who are currently happily employed at their jobs – adding value and appreciated. Stay away from anything other than glowing reports of how happy you are, how proud you are of what you’ve done, and how much excitement you have for work in general. It’s contagious. 4. Don’t be afraid to brag – gently. Most of you have no problems explaining what you’ve done, but you struggle when it comes to describing what you’re good at – you feel you’re being conceited or egotistical when you talk about how great you are. But if you don’t express it, who will? It’s a critical part of your elevator pitch that can’t be ignored. You don’t have to brag outright, but you do need to be explicit about your strengths. In our work with Ginny, we coached her to refer to her “ability to sell to senior management” – clearly conveying her strength in that area without going over the top. Just saying what you’ve done isn’t enough – you need to demonstrate that you were distinguished, recognized, or just in general good at it for it to be memorable. Mentioning things in context – that you were chosen from a pool of 50 people to lead a high-profile project – is a great way to convey that someone else thought you were awesome without saying it directly. 5. Be confident! Many people downplay their experiences before even starting –“Well, it’s not that important, but I led a project…” or “It wasn’t a big deal, but I was responsible for…” Stop right there! Lack of confidence will hurt you more than anything else. The reverse is also true – someone with zero relevant work experience will capture the attention of their listener if they demonstrate a healthy level of confidence. The first step is convincing yourself that your experience had value – don’t compare it to the value of what it could have had (you could have sold more lawn care services) or what you think the listener has done that’s been super impressive (they just sold a global business for $2M last year). You can’t worry that you’ll pale in comparison to anything, because you and you alone have the floor. The second step is presentation – when it comes to confident delivery, you’ll get there through practice (simulated and on-the-spot). 6. Select your most relevant experience to share. Don’t feel obligated to tell your whole story – save that for a later “walk me through your resume” question in an actual interview. Present your most relevant experience only. Remember, you’ve got only 1 minute (or possibly less) to make them want to hear more. You want every second to be meaningful and add to your brand statement, which means focus is required. Hopefully, your most recent positions (intern or otherwise) are at a brand name firm where you were in a position of responsibility, but we know this isn’t true in all cases. Don’t panic – go back in your professional history to your best experience – you don’t have to provide date context, so if you worked for a large corporation in a leadership position 6 years ago and small businesses ever since without much to show for it, tell them about the experience at the large corporation first. 7. Compose the story in a logical order. Don’t bounce around – you’ll lose your audience’s attention and make it harder for them to understand what you want them to do for you. Stick with the logical order – what you offer followed by what you’re looking for. If you have to break up your elevator pitch to foster a natural flow in conversation, that’s fine – in fact, you’ll find you have to do that more often than not. Cultivating a good conversation is just as important as delivering your pitch – a great networker does both. 8. Practice your presentation. We have all of our clients write out their elevator pitch in paragraph form, then practice their delivery with us. We recommend you do the same. Writing out your pitch forces you to hit all the key points and create natural transitions. Practicing verbally with a trusted friend or mentor will refine your delivery – you want to know it well enough to present at any moment, but you don’t want to sound like a bad actor who’s memorized their part! Practice, practice, practice – in front of your mirror and on the next plane trip you take. 9. Keep it to 1 minute or less. No one wants to listen to someone they just met talk about themselves for more than a minute! Keep your elevator pitch to 1 minute or less. Otherwise, you run the risk of permanently scaring off your audience. Even with this rule, be vigilant – in some cases, 1 minute may be too long. Watch for signs of boredom, fatigue, etc. If you see eyes wandering or arms fidgeting, that’s your cue to land it quickly. Your goal is to give them just enough information about you to leave room for questions, and not too much that they have nothing to ask at the end. Condensing your pitch to 1 minute will make sure you stay within these limits. 10. Land it with a question. Great networkers build relationships through conversation – and a good conversation requires two-way communication. Once you’ve given your elevator pitch, ask for the same from the person you’re talking to. It’s a natural segue, it shows that it’s not all about you, and it gives them the opportunity to do one of their favorite things – talk about themselves! A simple, “How about you?” or “Tell me about yourself” is all that’s needed to give the signal that it’s their turn to talk. No need to close the deal in the first minute – just work to keep the conversation going. If you’ve done a great job with your elevator pitch, you’ll notice some key themes reflected in the other person – they’ll mimic your style. They’ll come out with a positive, confident, and concise explanation of what they’ve done that will leave you asking for more. All of a sudden, what started as a 2-minute back-and-forth intro blossoms into an invitation for coffee, an introduction to a colleague, and/or an exchange of business cards or contact information. You’ve been giving your elevator pitch your whole life – but have you been doing it well? Have a story about using your elevator pitch to network successfully? Email us – we’d love to hear it! Looking for advice on crafting your unique brand statement? Get together with us for a one-on-one networking coaching session! Stay up to date on all things consulting! Best Airline for Consultants: Delta or United? Recently received an offer? Pay your best advice forward to the next generation of aspiring consultants. Do you have a case you would like to share? We are taking submissions for a free community case bank. Join our exclusive MC mailing list to receive discounts, special events, job postings, and more.